If you are going to host a basketball theme party we have the basketball theme decorations to make it a success. Serve your guests with basketball Dessert Plates and basketball napkins. Root for your favorite team with colorful basketball beads and cheer sticks. Finally, use basketball decorations like a Basketball Cutout and the basketball balloon holder as a basketball centerpiece. These decorations are also great to celebrate a basketball season. Get your team together and just have some fun with the decorations. And don't forget to ask about bulk discounts on select items! And of course we always love hearing from our very loyal customers! If you have any questions or even if you have an idea for a new product you'd like to see on our website, give us a call or leave us a message! We'd be happy to hear from you! 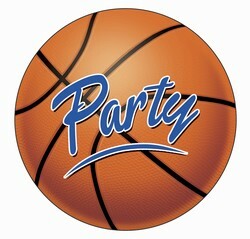 No matter what kind of basketball decorations and party supplies you are in need of we've got you covered! We're PartyCheap.com and we know how to party!